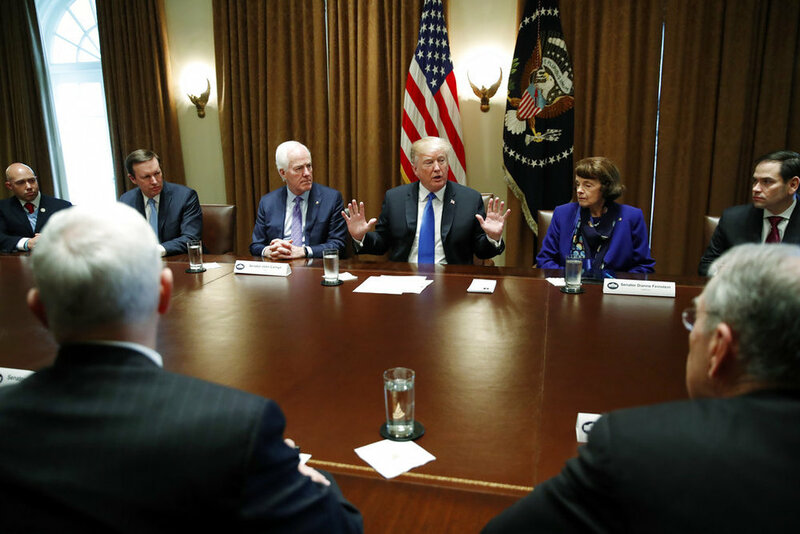 President Trump debated raising the gun purchasing age to 21, passing universal background checks and other potential methods of mass shooting prevention with Sen. Chris Murphy (D-CT), Rep. Elizabeth Esty (D-CT) and other lawmakers yesterday. Trump said he hopes his administration will able to take actions that address the issue of gun violence in America. Murphy stressed the importance of passing universal background checks, citing the “gun show loophole” that allows people to purchase guns at gun shows without passing a background check. “I think we have a unique opportunity to pass background checks and make sure nobody gets a gun in this country who shouldn’t,” Murphy said, referencing the over 95 percent approval rating of universal background checks and the lower number of shootings in states that require them. Part of the conversation was centered around getting guns out of the hands of people with mental illnesses, with Trump suggesting taking guns “early” from people who display serious signs of mental illness before “due process” in court. “I think we’ve got to concentrate not just on those who have mental health issues but on those who show a danger to themselves or others,” Grassley said. The lawmakers also debated raising the minimum age for all gun purchases from 18 to 21. Trump said, though previous presidents did not pass gun control legislation, he hopes he is the president that makes a change.